McMinnville Aircraft Modelers will host another Swap Meet on March 8, 2014 at the Yamhill County Fairgrounds in McMinnville, Oregon. Saturday May 24 at the CCRCS Field, Clark County Fairgrounds. Clark Country Radio Control Society invites everyone to its 5th annual Support the Troops Warbird Fly-In! For the pilots there will be a $15 dollar entry fee or $10 dollars and a large bag of non-melting candy. All of the candy collected will be sent to our troops around the world. All planes flown at this event need to be some type of military plane, and it doesn’t matter which era it comes from. There will be a separate raffle for pilots and spectators alike. Cash awards for the pilots will also be awarded. The prizes will be given out at 1:00 P.M. You must be present to win. There will also be lunch for sale at the event, and a great time will be had by all who show up! New Date Saturday, May 24th. 2014, 9:00 A.M.-1:00P.M. Pilot meeting at 8:45 A.M.
Clark County Fairgrounds, then follow the signs to the field. Come join us for our swap meet at Tug Lake on June 1st this year! Clark County Radio Control Society is sponsoring an exciting event to help reduce your hanger queen inventory and spare parts overflow! Spaces to sell in a designated area away from the flying are offered for a nominal $10.00 – no matter what you sell. . . no commissions to the club! You will need to bring your own table and cashbox , and having a small shelter might be helpful. Transactions will be between you and the buyer only. For location, follow the directions posted on the Wet Wings event flyer. This is a great opportunity to sell your stuff and see all the excitement at the float fly – try your hand on a buddy box! Flyers at the float fly will be able to have a table as well. Those flyers will have to make their own arrangements as to how to conduct and man their table. You are invited to attend the Noel Martin Memorial annual fun fly in McMinnville, Oregon. Please share the attached flyer with you club members. Lunch can be purchased for a donation to the club. It would be appreciated if you would have anyone who plans to attend RSVP so that we can ensure there is enough food for everyone. 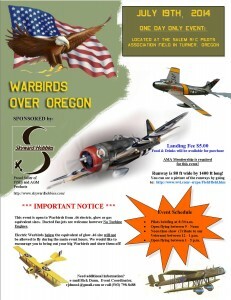 I would like to invite members of your club to the first Warbird Event being held by the Salem R/C Pilots Association in Turner Oregon. The event will not only be a Warbird event we will also be doing a tribute to our Veterans during the noon time break. The event will be a one day event this year; if there is enough enthusiasm for this event we are already planning to expand this event to a 2 day event in 2015. The landing fee for this event will be $5.00; there will be hot dogs and sodas on sale during lunch. I would be greatly appreciated if you could share the event poster with your membership by either e-mailing a copy of the pdf file to them or include the .jpg file as a page within your monthly newsletter. We know there are many Warbird enthusiasts in our state and we would like to see as many large scale Warbirds show up as possible. We have a 80 foot wide by 1400 foot long grass runway with not obstruction on either end or in front to impede your flying. Thank you for reading this and I hope to see all of you on July 19th, 2014 with your Warbirds!!! 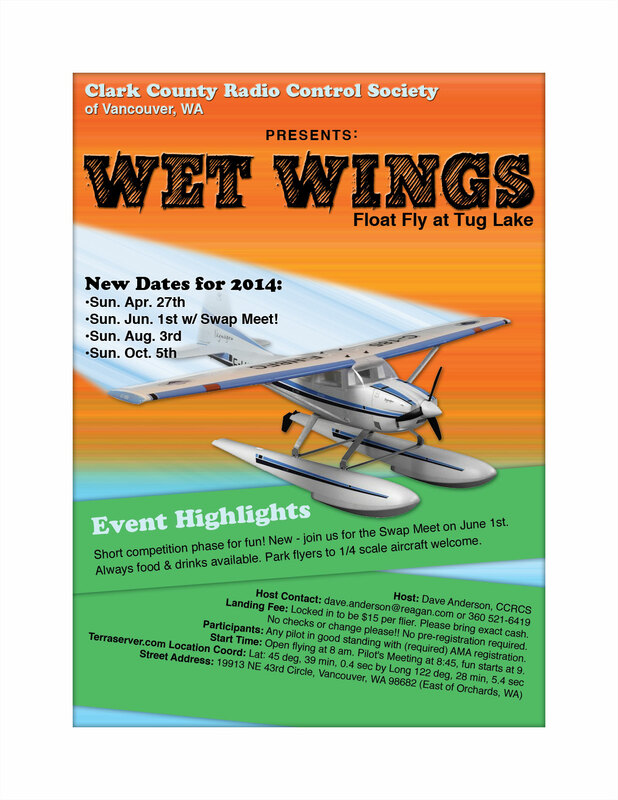 Come join us for another amazing event at Wet Wings – our regular event at Tug Lake neear Vancouver on Sunday, August 3rd. Directions and other details are listed on the attached flier. Like last year, we have agreed to be off the water by 1 PM for the skiers to use the lake. Past experience has shown this to be a suitable arrangement to keep our fly fees at a minimum, and to get out of the hot sun before it gets too warm! That fly time could be extended based on whether skiers show up at that time. The raffle for this event is the Neptune – a .25 size mono-hull plane that is just dream to fly! You can check out the .40 size version I fly on the water that day. Need to make it electric? – Just let me know! Luis will have a short, but fun competition phase ready for us, and of course our masterchef Jeff will have the hot dogs hot and the sodas/water cold! Need information on how to adapt floats to your plane? Contact me or another club member. I may have extra floats in my shop if the configuration will work. Come fly on the water, and get your wings wet! It’s fun, it’s easy on the planes, and we always have good time with good friends. Shout out to all our friends at SkyKnights and Fern Prairie – we look forward to seeing you there! • Paint ball shooting at a RC airplane. 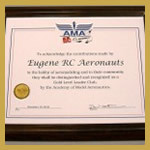 • There will be a landing fee of 2 CANS of food minimum for pilots. The annual Model Aircraft Exhibition is fast approaching. This year it will be held as a non-competitive event in order to encourage all types of models. The event is intended to expose the public to various aspects of modeling and possibly encourage some youthful participation. Please distribute the attached flyer to your club membership through your newsletter, meeting notice, or e-mail. We would like a good variety of models, even those displayed in prior years.